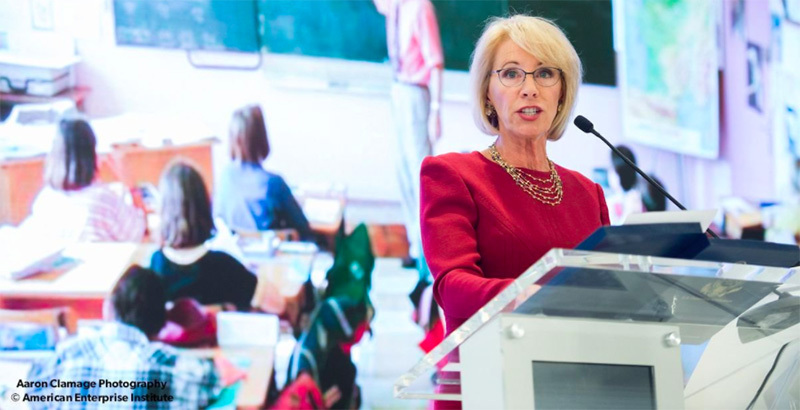 Previous federal efforts to reform education have not worked as hoped, Education Secretary Betsy DeVos said Tuesday in a speech that also called for expanding parental choice and a broad rethinking of educational priorities. She pinned the failures of those efforts — in particular, the landmark No Child Left Behind law, passed during the George W. Bush administration, and the Obama administration’s Race to the Top and School Improvement Grants programs — on their shared premise that the federal government can positively move the needle of American educational progress. “Perhaps the lesson lies not in what made the approaches different, but in what made them the same: the federal government…. The lesson is in the false premise: that Washington knows what’s best for educators, parents, and students,” she said. Though it played on familiar themes, the speech was tougher than DeVos’s typical remarks, which have been highly scripted and unassuming during her first year in office, as she has sought to rebound from a contentious confirmation process, low public popularity, and public events that are often marked by protesters. DeVos spoke at a daylong event at the American Enterprise Institute, a conservative think tank, devoted to lessons learned from school reform under Presidents George W. Bush and Barack Obama. In four panels preceding DeVos’s speech, researchers and former administration officials discussed changes to policies on accountability, standards, charter schools, research, teacher quality, and other issues, and lessons that can be learned from those changes. The impulse to reform schools via federal mandates stretches back even further than the previous two administrations, from standards reform efforts in the Clinton and George H.W. Bush administrations to the pivotal “A Nation at Risk” report during the Reagan years, all the way back to President Jimmy Carter’s establishment of the federal Education Department, DeVos said. “When we try the same thing over and over again, yet expect different results, that’s not reform — that’s insanity,” DeVos said. The secretary was clear to note that she did not want to “impugn anyone’s motives.” Everyone in education policy wants better results for students — a “unity of purpose” that isn’t evident in other policy areas, like taxes, immigration, or energy, she noted. Race to the Top was an attempt to figure out a way to stave off massive state budget cuts to education when the Great Recession hit, a concern for members of both parties, she noted. “The whole national political narrative and the polarization that sort of followed it is the lens through which we’re now looking back at a lot of this work,” she added. The Obama administration has been criticized for Race to the Top, a competitive grant program that gave additional points for administration-favored policies, like adoption of high standards or test-based teacher accountability systems. But the ideas in the application process came from states, Weiss said. During a question-and-answer session with Rick Hess, AEI’s director of education policy studies, DeVos said increased federal supports for charter schools and a new focus on data transparency were the only real positive outcomes from the Bush-Obama education reform efforts. “I think those two pieces ultimately had some good results for parents and for students, but I think from a federal policy perspective, there’s really not been anything that you can embrace as having been successful, broadly, for students,” she said. DeVos made three suggestions for improving education — all familiar for the secretary, who has advocated increased choice and a reduced federal role in the 11 months she has been in office. First, she said, the federal government shouldn’t function as a national school board. The Every Student Succeeds Act did a good job of returning power to states, but states should continue that path to allow additional flexibility to local districts, she said. Second, she urged “educational freedom” through more school choice. “Equal access to a quality education should be a right for every American, and every parent should have the right to choose how their child is educated. Government exists to protect those rights, not usurp them,” she said. Finally, she urged a broad “rethinking” of school, a theme she focused on during her back-to-school tour last fall and in roundtable discussions at the Education Department before the holidays. Everything from grouping students by age to school calendars to personalized learning should be on the table, she said.